All our catering menus are created by our Executive Chef, Tamara Kay, just for your event, theme, season, and budget featuring our gourmet food. Your event is unique and we are proud that in 13 years, no two of our menus are the same! While every catering menu is custom created and is priced differently, we do have priced sample menus we have done at previous events as examples at Sample Event Menus page. The seasons offer different fresh, local, ripe ingredients so we have different seasonal menus for each! Unlike most Portland caterers, we don’t just send off a standard menu for your event, Chef Tamara will develop a custom menu that will thrill your guests, with high-quality, easy to eat food. She considers seasonal availability, type of event (seated or standing), time of day, length of the party, and degree of formality when making catering menu selections. Happy guests and satisfied clients are the most important measurement of our services! See our Reviews from our real clients who have experienced our catering services. At Voilà Catering, we firmly believe that wonderful food does not need to be expensive. Our menu ingredients are always fresh, when possible local, and always seasonal. Our professional chefs make all of our menus items from scratch, never using expensive pre-prepared frozen “products”, expensive out-of-season produce, or pre-made sauces and salad dressings. This approach keeps the food costs reasonable and the quality of our food exceptionally high. While every menu and event is unique, typically our large event dinner menus are in the $15 to $26 range for a real, restaurant-quality meal. Gourmet finger food and hors d’oeuvres are primarily in the $0.80 to $2.50 range per piece depending upon ingredient cost. Voilà Catering is pleased to develop a multiple page proposal detailing every single expected cost including food, service, beverages and rentals…with never any surprises! To see hundreds of images from our catering events and to hear from our clients, click here to visit our facebook page and ‘like” us to keep updated on our latest events! While most caterers bring platters of pre-made and pre-cooked food to the events, to minimize the damaging effects of hot holding during transportion, all our hot food is cooked by our chef team on-site right before serving. 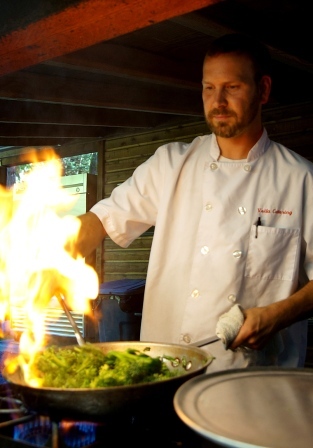 If you event location does not have an adequate kitchen, we will bring our full sized commercial convection ovens and sauté stations to the locations. Our delicate finger foods are assembled on site by a skilled chef, as they neither travel very well nor hold long enough for transportation. 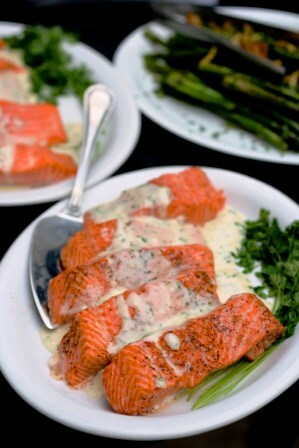 Our chefs consistently provide THE BEST CATERED FOOD in the state. We invite you to experience the difference of our restaurant-quality, gourmet food… even your most discriminating foodie guest will be thrilled! As we are all about the food, we have image galleries from our actual catering events. See examples of our hors d’oeuvres, fresh salads, hot entrees and sides, and sweet desserts. We believe that catering food should taste delicious and look beautiful! Voilà Catering does not have required or expected gratuities, which may range from 18% to 20% at other Portland catering companies and can amount to thousands of dollars. Our professional chefs and servers are paid a well-above average wage and it should be your standard expectation that all our staff provides excellent service. There is never a cake cutting fee and there are no “customary” service charges. All expected costs are presented up-front and honestly, without any post-event surprises. Voilà Catering is a full service event and catering company and we believe that the beverage service is an integral and very important part of the entire event. We provide professional licensed bartenders and servers to provide a full range of beer, wine, and hard alcohol. Our catering staff will provide courteous and responsible service for your guests while providing the host peace of mind with $1 million in liability insurance. For event quality, efficiency in staffing, & insurance liability reasons, at large events it is our policy is provide all the food and beverages (except at wineries and breweries, of course). We are pleased to share our expertise and help you plan your beverage needs at smaller events (less than 50 guests). Our OLCC License is #122696 and we are pre-approved by the OLCC for full service off-site catering. For more information about our affordable beverage service visit our Drinks and Beverage page. As presentation is an integral part of the food quality, Voilà Catering in Portland will manage and provide rental china plates, stainless steel flatware, elegant glassware and a selection of quality linens in 42 colors. For elegant catering events or wine paired dinners, we offer Schott Zwiesel German Crystal Stemware to compliment our premium wines. The prices for our rentals are at or below standard rental rates. Voila Catering will also plan and manage sub-contracted tents, dance floors, and AV equipment. Voilà Catering does not markup the standard industry prices on the sub-rentals. For buffets, Voilà Catering always presents food on china platters or our hot food in chafing dishes and Family-Style service includes all the platters for the tables at no additional charge. Real stainless steel service ware is always provided with our events…never paper or plastic. Our Rentals page provides pricing information on our event rentals. Voila Catering does not offer our delicious food on paper plates serve with plastic utensils for both quality and environmental reason. When planning a special event, every customer should know that METRO no longer accepts “compostable” paper plates or “compostable” flatware with the commercial compost. All compostable paper and plastic garbage from your event will end up in the landfill. Voila Catering minimizes your event’s environmental impact by using only re-usable china plates, real glassware, and real flatware for catering special events. Once in a life-time family events deserve great food and will benefit from experienced event planning. 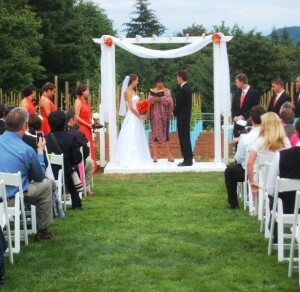 Voilà Catering has provided our food and services at hundreds of weddings, commitment ceremonies, and receptions. 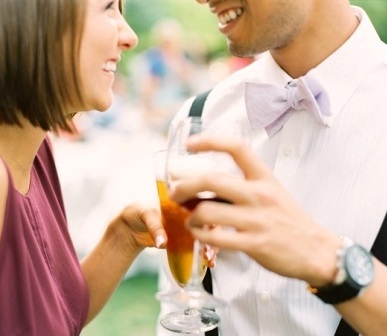 Our Weddings Page includes the 23 questions (and our answers) you should ask every caterer that you consider for your very important life event. Let our event planners guide you to the best values for venues, bakeries, and photographers based upon our years of experience without kickbacks or commissions swaying our professional judgment. We have many actual catering client quotes from our past wedding receptions, business celebrations, holiday parties, non-profit fundraising events and private family events on our References page. Check out our real client reviews on Google+ here. Contact Voilà Catering in Portland at 503-806-6658 or e-mail to events@voila-catering.com to check availability and schedule a free consultation for your event. Thank you for all the work and planning you put into our wedding. We have received compliment after compliment regarding the food and service. People keep telling us how smooth and organized the whole event felt. We could not have done it without you. Thank you again for giving us piece of mind and an event to remember! We had a wonderful experience with Jonathan and Tamara from start to finish. We planned our wedding reception dinner at the Laurelhurst Club in just a few months, and long-distance at that from England! From our initial inquiry, Voila Catering responded quickly with a series of really helpful questions that proved their expertise and helped us think through many important aspects of the evening we might never have considered. Their knowledge and input about menu, quantities, technical requirements, and even the evening’s schedule meant that they acted as more than just caterers, but really made sure the entire event was a success — making our lives so much easier. The menu they assembled was delicious and unique, with lots of locally-sourced ingredients, and accommodating our guests with special dietary needs. And they never batted an eyelash when we had to change some details last-minute. The day of the event they were courteous, calm, and unobtrusive. I would recommend them in a heartbeat! Voila Catered our wedding recently and the food was stunning! Jonathan and the team clearly have experience and exquisite expertise, and know the extras that you need before you think of them. Possibly the best decision we made in regards to the wedding!